Want the BDB app? Click a button and download now. God wants to use you in miracles this year. Here's PT 4 of what you need to know. God wants to use you in miracles this year. Here's PT 3 of what you need to know. God wants to use you in miracles this year. Here's PT 2 of what you need to know. God wants to use you in miracles this year. Here's PT 1 of what you need to know. Another New Year's resolution: love God more--but how do we do that? Listen in. and team in Portland, OR. WHAT DOES GOD WANT FROM YOU? 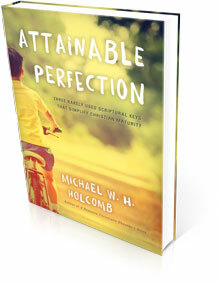 Host Michael W. H. Holcomb gives you straight-up yet thought provoking answers that are as freshly inspired as they are biblically sound. Tune in M - F to the 30 minute podcast that is perfect for personal devotion, group Bible studies, or simply finding out about Jesus Christ.